Most of us who are “of a certain age” know that the Republican Party of 2012 is very different than the one we saw in our formative years during the 60’s, 70’s and early 80’s. Although I’ve always had a sense of this — having grown up in Massachusetts where African American Ed Brooks, a Republican, was one of our Senators — but I probably couldn’t name the specifics behind this change. 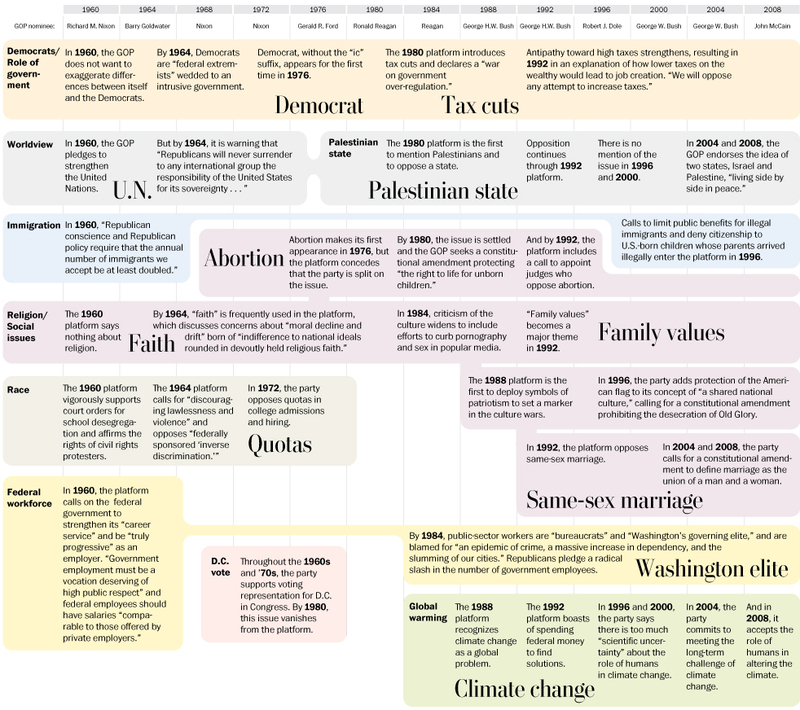 This article in today’s Washington Post, GOP platform through the years shows party’s shift from moderate to conservative, helps fill in those blanks. The full story is worth reading, but the graphic puts in in visual perspective. “‘Earmarks are a symptom of wasteful Washington spending that the American people have said they want reformed,’ [Texas Republican Sen. John] Cornyn told reporters,” reports today’s Washington Post (Republican senators say they’ll vote against their own earmarks). That would certainly be more accurate, though perhaps, like earmarks themselves, just a little too close to home.